The Smart Goals feature applies machine learning across thousands of websites that use Google Analytics and have opted in to share anonymized conversion data. From this information, we can distill dozens of key factors that correlate with likelihood to convert: things like session duration, pages per session, location, device, and browser. We can then apply these key factors to any website. The easiest way to think about Smart Goals is that they reflect your website visits that our model indicates are most likely to lead to conversions. 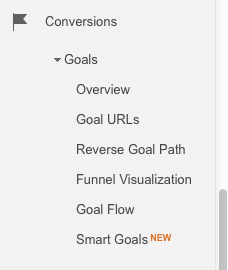 import Analytics goals into AdWords. As Greg Finn discusses in his article on Marketing Land, anyone with any type of sophistication should not use Smart Goals—it’s simply the “better than nothing” option. It sounds like Google’s goal was to help small businesses, brick-and-mortars, or local shops without contact forms or e-commerce. However, session duration, pages per session, and bounce rate can often be too vague to pinpoint true conversion behaviors. Meanwhile, popular issues like fighting click fraud or finding a simpler way to perform multi-session analysis remain unsolved.